Home » History » Pirates versus Smugglers! Pirates versus smugglers? Well not in any battle I know of, but it could well have been, as the two groups of varmints were of a different ilk. I often hear people say ‘Julie writes about pirates’. I’ve been asked to do talks about pirates, but it’s smugglers I know about. What’s the difference? Both were mostly a bad lot, both engaged in organised crime – but they were different kinds of criminals – here’s how. The first thing that springs to many people’s minds these days when pirates are mentioned is Johnny Depp and his pirates’ series of films. Pirates worked on the high seas attacking ships and seizing them and the goods they were transporting. In the 17th and 18th centuries gold in particular was transported from South America to Europe, making attacks frequent and lucrative. But it wasn’t only the Caribbean. In The Moonrakers of Avon Danny hears of an event in his Uncle John’s life that he’d not been told of before. He knew Uncle John was a seafarer, working the East Indiamen from England to India. But was unaware of a single event (I will not relate it here – no spoilers!). These were long and arduous journeys made no easier by the threat of piracy. The pirate gangs had spies in ports such as Bombay (Mumbai) who would listen out and report on the cargoes the ships would be transporting. The Malabar coast of southern India was notorious for piracy. The ships would be laden with expensive goods, silks and spices from the orient. These also were vulnerable to attack. The pirates were ruthless, killing ships’ crews and stealing both ship and contents. Some pirates were infamous and were much feared. They often commanded several ships and had an ‘army’ of pirates crewing them. There are a number a famous pirates whose names – and nicknames will be familiar. 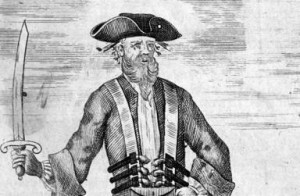 Edward Teach ‘Blackbeard’ was English, Captain William Kidd, was Scottish and Bartholemew Roberts, Black Bart, was Welsh. All were eventually caught and executed. In the 18th century heyday of the ‘free-trade’, fights that smugglers got themselves into were with the authorities who were trying to stop their illegal importation of goods, such as tobacco, wines and spirits, to avoid paying tax at the ports. There were customs ships of the waterguard and also navy ships to help seek, stop and seize goods from smugglers’ ships. The whole of the English coast was affected by this activity. In The Thirteenth Box, Will Gibbs has a good knowledge of what goes on and explains things to Danny Clarke, who is amazed at Will’s knowledge. In The Face of Sam, smugglers from Kent and Sussex attacking Poole customs house to retrieve goods seized at sea, a real event, is used as back story. 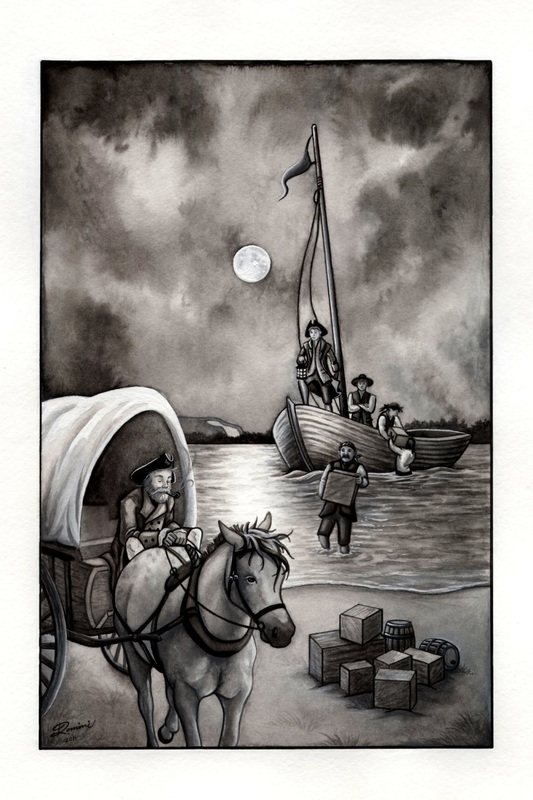 The gangs were funded by individuals, venturers who provided the ships and the cash to pay for the goods. Most southern coastal towns of England have their own ‘famous’ smugglers. Local people would get involved either to crew the ships or to help unload, hide and transport the smuggled goods. In Christchurch it is John Streeter who takes the crown. Streeter was a local businessman who owned a tobacco / snuff factory in Stanpit. Originally from Chatham in Kent, he married a Christchurch girl, Rose Button. He had his own ship, The Phoenix, which he used to transport smuggled goods, hidden amongst legitimate cargoes and was under the eye of local customs. Customs offices were then in Southampton, Poole and Cowes, Isle of Wight. Complaints of unfair trade against Streeter were made by other tobacconists, but somehow, during raids, Streeter always appeared to have the correct paperwork. The most notorious episode in Christchurch’s rich smuggling heritage is the Battle of Mudeford of 1784. This involved two of Streeter’s ships, the Phoenix (which had once been seized by the customs, but Streeter managed to get it back) and the Civil Usage. The landing was thwarted by HMS Orestes and a huge battle between the smugglers and customs ensued. Smuggling continued into the early 19th century when eventually the punitive taxes were removed and the ‘Trade’ became less lucrative and faded out. As with piracy smuggling still exists, not just in England. Drugs and narcotics are illegal and expensive, making the smuggling of them extremely profitable. Recently we have seen a rise in the horrific activity of people smuggling, taking advantage – and much cash – from people desperate to flee conflict and poverty. Thus you have the difference between pirates and smugglers. Pirates worked the seas attacking ships and seizing goods; smugglers illegally imported goods into England to avoid paying duties. Sadly, such activities are still carried out today with awful consequences.